Here's a roundup of some of the New York Fashion Week lounges! From primping to food and refreshments, it's a great way to enjoy some down time in between shows! The Elizabeth Arden Red Door Bus offered complimentary on-the-spot hair styling, makeovers and manicures and served up breakfast and lunch, right around the corner from Lincoln Center. The Men's Style Retreat, presented by New Era was held at the Empire Hotel on September 13th & 14th, with Skin Spa providing complimentary massages and facials, Christo Salon NYC styling hair and La Casa Grande Tobacco Company hand rolling cigars. The lounge wouldn't be complete without music by DJ Skooby and drinks by Purity Vodka. 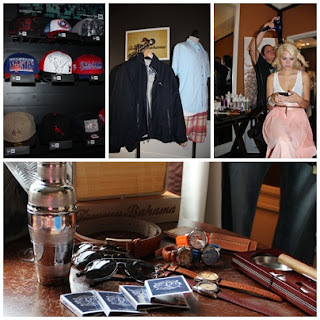 Tommy Bahama showcased some upcoming apparel pieces, watches, sunglasses and other accessories. Media and VIP guests picked out their favorite New Era caps and fedoras. The Porsche Design lounge provided food and refreshments as well as a look at the spring collection, including leather jackets and colored denim.